Sometimes you can see a photograph of a wrecked ship, and when you go to the site to dive on her, you are often surprised to find that she lies in exactly the same place as the photograph shows. The liner Jebba is one of these wrecks, and the photograph that shows her wrecked under the cliffs near Bolt Tail, also shows her exact location. Built originally as the Albertville in 1896 by Sir Robert Dixon and Company, she was later taken over by the Elder Dempster line and renamed the Jebba. 302 feet long and 3813 tons gross, the Jebba was homeward bound from Sierra Leone carrying a cargo of rubber, ivory and fresh fruit worth over ?00,000. Besides this cargo she was also carrying 155 passengers and crew, and the Royal Mail. The Jebba aground near Bolt Tail. In the early hours of 18 March 1907 the Jebba overshot the Eddystone in dense fog and ran aground under the steep cliffs at Whitchurch, just a few yards away from Bolt Tail. The ship immediately started to take in water, and after sending up distress rockets, the Captain ordered all the boiler fires to be doused to prevent the risk of an explosion. Being broadside onto the rocks, waves soon started breaking over the liner’s decks, but instead of the usual panic, the passengers and crew remained exceptionally calm, and all went dutifully to their lifeboat stations to await the Captains orders. Very quickly the Hope Cove lifeboat, which was literally around the corner, came upon the scene and because it could not get into the comparatively sheltered water between the Jebba and the shore, it was considered too dangerous to attempt to take people off from the weather side as it would mean cragging all 155 people through the rough seas. However, with the aid of a rocket apparatus and the extraordinary bravery of two local men all the passengers and crew were eventually saved. At the boiler of the Jebba. In order to get the rescue started, Issac Jarvis and John Argeat climbed down the treacherous 200 foot cliffs in complete darkness to set up a bosun’s chair, with which they rescued over a hundred persons. So impressed was everybody by their selfless bravery that King Edward VII personally approved that the men be awarded the Board of Trade Bronze Medal. They were also awarded the Liverpool Shipwreck and Humane Society Silver Medal. Issac Jarvis and John Argeant – courtesy of Pauline Lane. Mind you it was not only people that were saved. At least one chimpanzee and three small monkeys were hoisted ashore, and many homes around Hope Cove suddenly found themselves in possession of a brightly coloured parrot. Soon after the rescue the Jebba filled with water, and although most of the cargo was eventually salvaged, it was obvious that the liner was a complete write off. Once again Bolt Tail had claimed another victim. Chipping a valve off the Jebba. Today the remains of the Jebba lie in less than thirty feet, exactly where she it, which is as close into the rocks as you dare take your boat. As you look at the shore from the sea, her stern lies to your left and her bows to the right. The bottom consists of rock and sand, and in the summer there is quite a bit of kelp. The wreckage lies all around you and so does the brass and copper. Most of it is well crudded into the wreck but the odd valve is still available if you look hard enough for it. Where the stern is, two rocks break the surface, and in between these lies the rudder, still more or less complete. As you fin from the stern along the ribs and decking of the Jebba, you come to a stretch of sand upon which lie two boilers, one stuck up on it’s end. Further out from these are rocky gullies with all sorts of bits of wreckage, broken pottery, and pieces of brass nametags crudded into the rock. I have not found any pottery artifacts myself, but I do know that in 1971 a diver found a whole dinner plate with her old name of Albertville on it, so there must be some of it still left around. Because it is such a shallow wreck you can spend a lot of time on it, and in between you can gaze at the truly magnificent scenery provided by the huge cliffs and caves. It is a very impressive place, and how those two local lads managed to scramble down the cliffs in total darkness beats me. Opposite the upended boiler, close into the shore, is a part of the hull that seems to have been compressed. There are pieces of brass and copper sticking out all over the place, although most of it is only a few inches long, and firmly welded to the rest of the iron plating. The action of the sand and waves has burnished it all shiny bright, and in the sunlight it all sparkles like jewels set into a rusty crown. And that is what this little wrecksite is, a real gem. On a sunny day, the diving and the spectacular scenery should keep you amused for hours, and long after you have returned home the memory of that day, I am sure, will linger on. I am very gratefull to Pauline Lane for providing the photo, and for correcting me on some points. “I was interested to see the report on your website about the wreck of the SS Jebba near Hope Cove in South Devon. I have an interest in this ship, not as a diver but because John Argeat was my husband’s Grandfather. I have done extensive research to ascertain the true facts about the awards to John Argeat and Isaac Jarvis. I have searched the records and have been able to establish that the 2 men did not receive the Albert Medal, as stated in some reports, but the Board of Trade Bronze medal and also the Liverpool Shipwreck & Humane Society silver medal for gallant conduct. I have seen the actual BOT medal, which is in the possession of John Argeat’s granddaughter, and I have a copy of the entry in the Board of Trade registry. I would be grateful if your article could be amended to read “The King personally approved that the men be awarded with the Board of Trade Bronze medal”. The medal was not actually “personally presented”. This award, I understand, is second only to the Albert Medal, so still a very great honour. I am very gratefull to Ronald Aitchison for the information below. Sister Helen Mclean was a member of the Wesley Deaconess Order serving in Freetown, Sierra Leone. 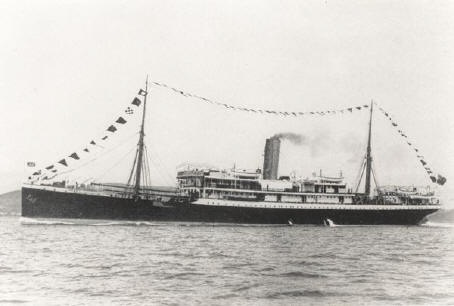 She had sailed from England in October 1905 aboard the Mendi another ship of the Eder-Dempster line and in accord with the system of the Deaconess Order she was returning on furlough on the Jebba. Her time in Sierra Leone was taken up with the work of re-establishing a school for girls in Freetown a task to which she would return ofter her six months furlough. She writes, in a letter, to the Church of her experiences aboard the Jebba, describing the events in detail. Her description of her rescue from the ship by bosun’s chair is a model of calm and ladylike reserve: somewhere about six o’clock, I think, I found myself being assisted on to the chair – really just a strip of wood like a swing – I was told to hold tight and shut my eyes, and a few minutes after, I felt myself being seized hold of and deposited somewhere on the rocks. There we women sat huddled together until the men got off. That was an anxious time. The waves were breaking over the ship more and more, and when we knew that all were really ashore the relief was almost too much. Then came the ascent of the cliff, which was, to say the least, a dirty and difficult undertaking. The first half I managed with only the assistance of the rope, along which I pulled myself hand over hand. There was a gentleman behind me who would have been ready to catch me had my grasp or footing failed. About half way up a burly coastguardsman met me and tied a rope round my waist. Then I seemed to be helped by so many, my recollections are somewhat confused. So far as I remember the coastguardsman got behind me and pushed, the rope around my waist was pulled from the top, two others came down and got hold of my arms, and the top was gained. I was thrust into the arms of some ladies who poured brandy down my throat, and finally set on the ground, feeling not a little amused. Sister Helen’s closing comment in her letter is of her “shame” at turning up back at the Deaconess Headquarters out of uniform! I stumbled across this completely by accident – I am publisher of a new book on aviation pioneer Alliott Verdon-Roe (of AVRO fame) by Peter Clegg. The family records show that the steamship Jebba of the African Steamship Company (managed by Elder Dempster and Co) was one in which Alliott served as Fifth Engineer in 1900-01 on routes to West Africa. Aliott also served in the Line’s SS Inchanga, Cameroun and Caucasian, rising to Third Engineer. We are trying to local any images of the vessel for Alliott’s grandson Eric who maintains the family archive. I am currently researching ‘The Family Tree’ on behalf of my aunt, who asked me to investigate and expand on certain family members. As I am the oldest male  of our side of the ‘Hayter’ clan, I am in possession of much memorobilia -including birth certificates, medals etc. One of the medals is the Bronze Medal for Gallantry for saving lives at sea. This belonged to my great grandfather Mr Robert Hayter of Hope Cove Coastguard, Devon. It was awarded for his services at the wreck of SS Jebba. I have the original covering letter signed by LLoyd George and dated 14 August 1907. I hope this may be of interest to you and your associated societies. If you wish I can E-Mail you the letter. Found a prayer book belonging to my Great Uncle Harold Nye who was First Officer on SS Jebba, so Mum says. By the name inside the front cover, I wonder if Uncle Peter took it with him to India in WW 11. Hi, I came across your website, whilst searching for information on The Board of Trade Bronze medal and Liverpool Shipwreck Humane society Silver medal which were awarded to Issac Jarvis and John Argeat for the brave rescue of over 150 people from SS Jebba in 1907. I am Issac Jarvis’s great granddaughter and was fascinated to read the comments and stories posted on your website although I have found out some of the history of the event it is still great to hear more. My Great grandfather was also coxswain of the Hope Cove lifeboat for some years and to go full circle my son is a volunteer crew member of the new privately funded Hope Cove lifeboat. We as a family are very proud of our roots and the braveness of Issac and John, and would like to find out more if anyone knows. I recently came across the name of Isaac Jarvis when researching a book on air crashes in WW2. On 16 September 1943 an American Flying Fortress of the 407th Bomb Squadron had been damaged by German fighters over France and it came down in the sea a mile off Burgh Island. The ten man crew managed to get into their life raft, although one of them was badly injured. Isaac Jarvis, then 78, was returning to Hope Cove in his fishing boat; he was accompanied by his 20 year old grandson. They went to assist the bomber’s crew and managed to rescue all of them despite the risk of overloading their small vessel. For their courage and resourcefulness, the Americans presented Isaac and his grandson with a silver cup. We have, at home in Salcombe, a table and a chest of drawers which we believe to have been made out of wood reclaimed from the Jebba by my Mum-in-laws uncle Henry Stone.